Monthly Swimming Pool Cleaning Service’s in Rancho Cordova California. Choosing the best pool cleaning company and pool cleaning service in Rancho Cordova can be a hard task. that's why we simplify the process. We have three basic services. Complete | Basic | Chemical Balancing Only. Our Swimming Pool cleaning Services have been helping people just like you maintain their residential swimming pools in Rancho Cordova with little or no effort. You can count on expert our advice and the attention to detail in every pool we maintain. CAL Pools will keep your pool looking perfect pool just for you. The Complete Cleaning - This a full Pool Cleaning Package which covers service work on everything from pool chemicals to vacuuming and skimming. Four visits per month. Basic Cleaning - This similar to our Complete Cleaning except that it does not include cleaning, vacuuming and netting. Two visit per month. Chemical Balancing - Balancing chemical to water only. Two visit per month. We provide weekly service to both commercial and residential pools and spas in all of Rancho Cordova Valley. Complete Cleaning Service tasks performed. Customers on our our Basic Swimming Pool Cleaning Service Plan will get these tasks performed on a bi-weekly basis by a qualified technician. Customers on our Chemical Balancing Monthly Service will get these tasks performed on a bi-weekly basis by a qualified technician. You can switch and between any of our monthly service packages just by letting us know at the beginning of the next cycle that you'd like to change. The following month if you'd like to switch back to the complete package, that's no problem. 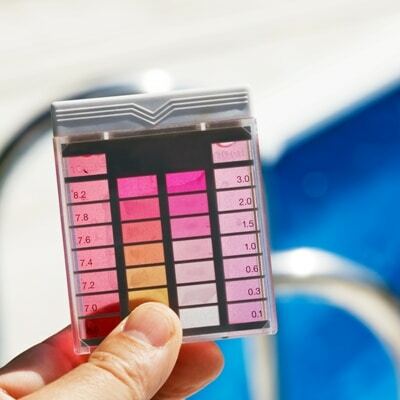 Below is a list of the elements we check for one we test your pool. If your pool or spa has seen it's best day long time ago, our expert restoration team can restore your pool to new look it had years ago. We offer a range of services in Rancho Cordova for all your pool cleaning and service needs in Rancho Cordova, you can trust the team at CAL Pools with your pool cleaning.